The All Friends Animal House Cleaner from Chrisal is a powerful probiotic cleaner for all types of animal enclosures. The foam cleaner from Chrisal deep cleans any surface and provides an effective removal of foul odours. Deep cleaning penetrates and removes the smallest microscopic impurities from surfaces. Removes and prevents unpleasant odours. Applying safe and healthy bacteria to surfaces. Animal houses (cages, kennels, runs, stables etc.) are often contaminated with, among other things, excrement, food residues, dirt and other materials. This can lead to unpleasant odours. This foam cleaner from Chrisal cleans deep into the surface, targeting and removing these odours. 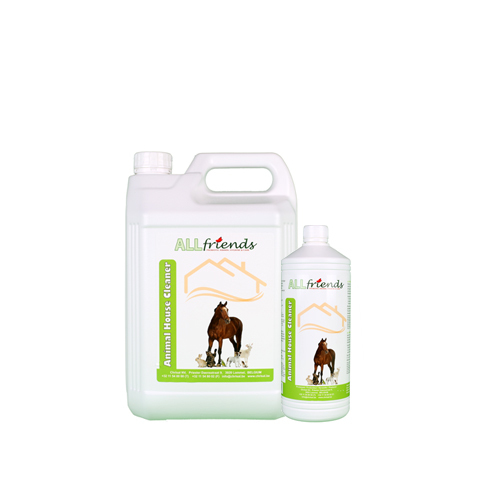 All Friends Animal House Cleaner is a highly concentrated biodegradable foam cleaner, enriched with probiotics for all types of animal enclosures and resting places. The cleaner has a long residual effect on enzymes and probiotics, so the risk of bad odours and infections is lowered considerably and ensures healthy bacteria in the area. Additionally, the All Friends Animal House Stabilizer can be used to ensure a good balance in the bacteria. Shake the All Friends Animal House Cleaner before use. Dilute 5% of the product with hot water and wipe the area. Keep the All Friends Animal House Cleaner between 5 and 40 degrees C, away from direct sunlight and out of reach of children. The diluted product lasts up to 5 days. Surpluses can be discarded down the drain. A micro-organism is an organism that is too small to be seen with the naked eye, (such as viruses, bacteria, fungi, yeasts and algae). The majority of microorganisms are benign, useful or even necessary for humans, animals and the environment, (for example, the bacteria in the digestive system). Unfortunately, there are also a number of micro-organisms that are harmful to humans, animals and the environment, such as microorganisms that create disease or food spoilage. Bad hygiene enables these malicious microorganisms to thrive, therefore it is very important that the area is regularly cleaned and disinfected. In this product are good probiotic micro-organisms, also known as probiotics, which form and maintain healthy bacteria, so malicious microorganisms have no chance to accumulate in the environment. What is the difference compared to conventional cleaning? Conventional cleaning products contain chemical substances which kill bacteria. These micro-organisms can develop a resistance to the chemicals, enabling more harmful germs to survive. This results in a more unhealthy environment - and less and less beneficial micro-organisms. Certain substances in these detergents can be harmful to your pet. Deep cleaning: probiotics remove dirt and microorganisms deep in different surfaces. Odour Control: odours are often formed by unwanted microorganisms and they are replaced by probiotics which produce no unpleasant odours. Safety: Unlike many chemical cleaners and disinfectants, probiotic cleaning products are very safe to use. Environment: probiotics are not only 100% natural, they also contribute actively to wastewater treatment. They help sustain a healthy environment rather than just being environmentally friendly. Probiotic cleaning chemicals disrupt bacteria from developing a possible resistance. Have you used All Friends Animal House Cleaner before? Let us know what you think about this product.